BB Creams There are 3 products. Cover and treat blemishes: acne, sun spots and age spots with our 85% NATURAL BB cream! 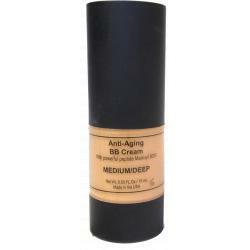 This multifunctional cream nourishes skin while acting as a moisturizer, primer, foundation, concealer and sunscreen. Can be used as an alternative to foundation, for those like a lighter look and who do not like the traditional style of makeup. Cover and treat blemishes: acne, sun spots and age spots with our 85% NATURAL BB cream!This multifunctional cream nourishes skin while acting as a moisturizer, primer, foundation, concealer and sunscreen. Can be used as an alternative to foundation, for those like a lighter look and who do not like the traditional style of makeup.